The best films of the year, plus Spike Jonze’s computer romance, Bong Joonho versus Harvey Weinstein, Alexander Payne and Bruce Dern on Nebraska and David Thomson on Robert Redford. 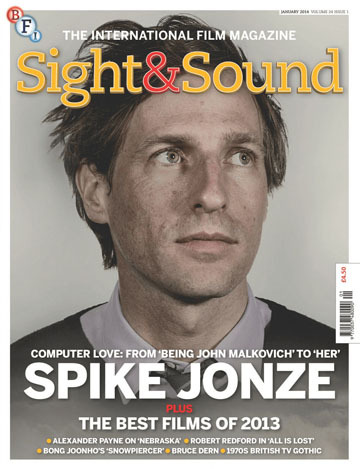 The best films of the year, plus Spike Jonze’s computer romance, Bong Joonho versus Harvey Weinstein, Alexander Payne and Bruce Dern on Nebraska and David Thomson on Robert Redford. Her, the story of the love between a man and a computer, feels like Spike Jonze’s most personal film yet. But, the director says, from features to pop videos, it’s all personal. He talks about alienation and romance in the age of smartphones and Jamba Juice. By James Bell. The sheer number of films screening in 2013 might have made it harder than usual to predict a winner in our poll, but it has also meant the quality of those in the running has never been higher. By Nick James. Read our top ten films and highlights from our editors here. Plus: 55 critics review the year in cinema. Bong Joonho’s Snowpiercer was one of the most anticipated films of 2013. But while it has been a hit in France and Korea, English-speaking audiences won’t be able to see it for some time to come. This is more than just a case of the wrong kind of snow. By Tony Rayns. Robert Redford’s intense, elemental performance in J.C. Chandor’s exceptional survival drama All Is Lost sees the actor turn his back on his screen persona to portray an ordinary man facing extraordinary challenges. By David Thomson. With his idiosyncratic, gently comic films, the director has shown a canny ability to walk the line between mainstream acceptance and indie credibility – and his latest, the bittersweet black-and-white road movie Nebraska, is no exception. Interview by Neil McGlone. PLUS The actors: Bruce Dern The star of Nebraska explains what drew him to the near-silent role of Woody Grant, and casts his mind back over 50-plus years in the fray. By Nick Pinkerton.